Trucking is much more than just about truck jobs...it is a lifestyle. Traveling the country, living in the truck, and never knowing where the next load might take you becomes your life with a cdl job. Yes, you get to go home every few weeks, but you'll find that you are no longer part of the everyday lives of your family and friends, so you will be treated more like an acquaintance than a loved one. Over the road trucking jobs usually entails staying out on the road for at least three weeks at a time. Let m e say this right off...if you have a family, and you would like to KEEP that family....stay away from this option. It's a family killer. I've seen it a million times. If you're single, don't have any children, and like the idea of traveling the country and actually living a nomadic lifestyle...long-haul truck jobs is for you. When I started my cdl jobs I was 21 years old. I had never been married, had no children, and hadn't traveled much. The idea of living on the road and seeing the entire country and trucking coast to coast sounded awesome! So off I went trucking. Well, no it probably wont. You see, people have their own day to day lives that don't involve you anymore. They haven't seen most of the places you have, they haven't had truck jobs, they haven't lived on the road, and they simply can’t relate to anything you've been through. They have their own concerns at work, at home, and with their friends. Your stories will interest them for a short bit, but they will soon want to get back to their own lives, of which you aren't really involved. The other thing that surprised me right away about trucking is the ENORMOUS amount of time you spend alone. And I mean alone. I'd estimate 20 out of every 24 hours each day you will be by yourself. You will pretty much never come across even one single person you know. Trucking is a life of solitude and strangers. Waitresses, dock workers, and other drivers will be your main company with most truck jobs. The nice part is that truck stops are open 24 hours/day, 7 days/week. You can go inside anytime and have somebody to talk to. Anytime. There will be waitresses and other truckers in there and someone is always interested in a talk. Funny thing is, after years of being on the road I got used to this. I came off the road and bought my own house where I live alone. I found myself going up to the local truck stop quite a bit because I was used to having people to sit and talk with anytime I liked. I missed it. So it just goes to show that you can learn to enjoy almost anything once you've gotten used to it. Now the money part of over the road truck jobs is great. With most companies you will get paid by the mile(there are some exceptions I'll discuss later) and will almost never, ever have to unload any freight. If you are willing to do a lot of driving and would like to make as much money as you can without burning yourself out, you can expect to make around $35,000-$45,000 your first year, and anywhere from $40,000-$55,000 from your second year on. The days are long, but all you really do is drive. Because you actually live in the truck for weeks at a time, the equipment at any decent trucking company is usually top notch. You should never have to drive a truck that is more than 3 years old, and a good trucking company takes excellent care of its equipment. They normally wont hesitate in the least when you request to get some work done. The truck pretty much stays in brand new condition. Life on the road definitely takes A LOT of getting used to. But after a while you'll find that if the lifestyle suits you, it really is incredibly fun. We called ourselves “professional tourists”, which really is pretty accurate. You basically get paid to drive around the country in brand new rigs, see the sights, meet new people everyday, eat great food, and make great money. If you decide to give up your apartment or home, which most people end up doing because you're paying for something you almost never use, you'll be able to save up tons of money because your only living expenses are food and fun. You have no rent, utilities, insurance, or car payments, so all that money just piles up in the bank. Most truck jobs will let you take your truck home with you, and if you're a good, safe, reliable driver and you kinda lay low, they'll let you use your tractor as your personal vehicle when you are at home, so you wont even need your own car. Besides, when you come in to visit family and friends for a few days each month they will usually take you places or let you borrow their vehicle if need be. So living this lifestyle is a great way to save up a lot of money fast. Lastly, over the road truck jobs are by far the easiest to find and have the lowest qualifications because they are hard jobs for the companies to fill. There just simply isn't enough people that are able or willing to live this lifestyle, at least not for long, so the companies are always desperate to fill these positions first. 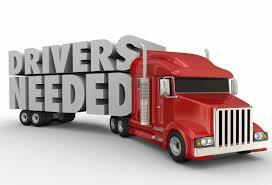 That's why they are usually the best paying and easiest jobs to find in the trucking industry.